Sales kicked off earlier this week for Shenandoah National Park Five Ounce Silver Bullion Coins, the second 2014 bullion issue from U.S. Mint’s series of America the Beautiful Five Ounce Silver Bullion Coins. 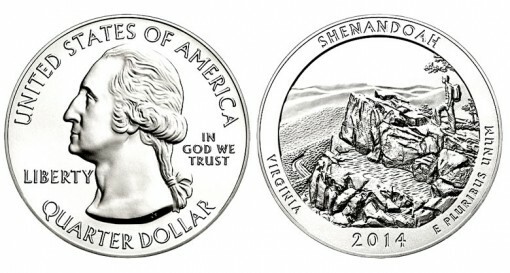 It has a design identical to the Shenandoah National Park quarter. These three-inch coins, which are struck for investors, are not offered directly to the public by the U.S. Mint at a static price like the collector uncirculated versions with the ‘P’ mint mark. They are sold through the U.S. Mint’s network of distributors for a few dollars over every ounce of silver they contain. The collectible version is scheduled to launch on May 15, 2014 for $154.95. 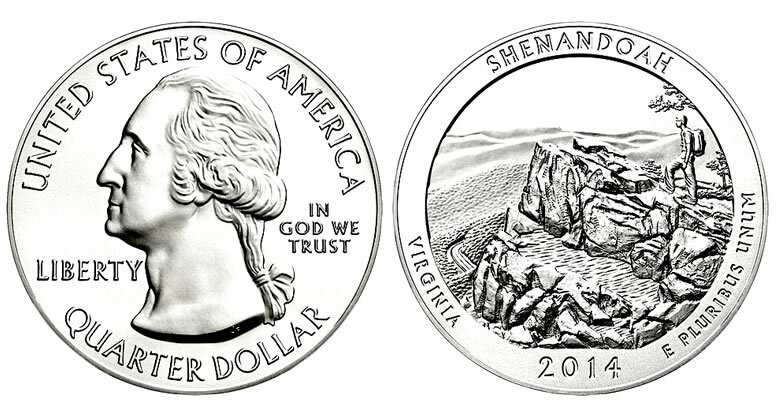 The U.S. Mint released the Shenandoah quarters on March 31, 2014 and continues to sell them in rolls and bags. First U.S. Mint reported sales of Shenandoah National Park Five Ounce Silver Bullion Coins appeared Tuesday, May 6, at 14,800. That was stronger than the 10,500 opening for the Great Smoky Mountains National Park Five Ounce Silver Bullion Coin which now has sales of 26,500. By Wednesday, May 7, Shenandoah coin sales rose another 400 to 15,200. Still to come this year are quarter and five ounce releases commemorating Arches National Park, Great Sand Dunes National Park and Everglades National Park. Here is a table of current sales for the bullion and uncirculated America the Beautiful Five Ounce Silver Coins. Those with a "*" have sold out.